hag Adolf Hitler (a-zehou), e 1937. Ar Faskouriezh a zo un ideologiezh aotrouniek ha broadelour he deus aon rak un doare diskar sevenadurel ha broadel, hag a fell dezhi lakaat da darzhañ un adsavadeg vroadel dre uhelaat ar mennozhioù a ouenn hag a vroad ha dre luskañ an nerzh, an unvaniezh hag ar glander. Perzhioù liesek a ro ar glaskourien d'ar faskouriezh, met an elfennoù-mañ a vez gwelet evel elfennoù diazez : broadelouriezh, milouriezh, diktatouriezh, aotrouniegezh, poblelouriezh, kenberc'hennouriezh, stadouriezh, emelouriezh sokial ha steuñverezh. Ouzhpenn-se e vez enebet ar faskouriezh ouzh ar frankizouriezh klasel hag ar gomunouriezh. Dont a ra ar ger eus an italianeg fascimo, deveret eus fascio, ar feskenn (kenstrollad gwalinier ha bouc'hal) a veze douget gant al lictores en amzer Roma Gozh. Ciano, Galeazzo – 1945 – The Ciano Diaries, 1939—1943 – Simon Publications – ISBN 978-1-931313-74-2. De Oliveira Salazar, António – 1939 – Doctrine and Action: Internal and Foreign Policy of the New Portugal, 1928-1939 – Faber and Faber. Gentile, Giovanni – 1932 – The Doctrine of Fascism – Enciclopedia Italiana. Mosley, Oswald – 1968 – My Life – Nelson Publications. Mussolini, Benito – 1998 – My Rise And Fall – Da Capo Press – ISBN 978-0-306-80864-7. Mussolini, Benito – 2006 – My Autobiography: With "The Political and Social Doctrine of Fascism" – Dover Publications – ISBN 978-0-486-44777-3. Primo de Rivera, Antonio – 1971 – Textos de Doctrina Politica – Madrid. Baker, David – The political economy of fascism: Myth or reality, or myth and reality? – New Political Economy, Vol. 11, No 02/06/2006, pp. 227 – 250. Ben-Am, Shlomo, 1983 – Fascism from Above: The Dictatorship of Primo de Rivera in Spain, 1923-1930 – Oxford University Press – ISBN 978-0-19-822596-6. Costa Pinto, António – 1996 – Salazar's Dictatorship and European Fascism: Problems of Interpretation – Social Science Monographs – ISBN 978-0-88033-968-1. De Felice, Renzo – 1977 – Interpretations of Fascism – Harvard University Press – ISBN 978-0-674-45962-5. De Felice, Renzo – 1978 – Fascism: An Informal Introduction to Its Theory and Practice – Transaction Books – ISBN 978-0-87855-619-9. Eatwell, Roger]] – 1996 – Fascism: A History – New York: Allen Lane. Fritzsche, Peter – 1990 – Rehearsals for Fascism: Populism and Political Mobilization in Weimar Germany – New York: Oxford University Press – ISBN 978-0-19-505780-5. Goldberg, Jonah – 2007 – Liberal Fascism: The Secret History of the American Left, from Mussolini to the Politics of Meaning – New York: Doubleday – ISBN 978-0-385-51184-1. Griffin, Roger – 1991 – The Nature of Fascism – New York: St. Martin’s Press. Griffin, Roger – 2000 – Revolution from the Right: Fascism, pennad e David Parker (emb. ), Revolutions and the Revolutionary Tradition in the West 1560-1991 – Routledge, London. Griffiths, Richard – 2001 – An Intelligent Person's Guide to Fascism – Duckworth – ISBN 978-0-7156-2918-5. Kallis, Aristotle A. – To Expand or Not to Expand? Territory, Generic Fascism and the Quest for an Ideal Fatherland – Journal of Contemporary History, Vol. 38, No. 2. (Apr., 2003), pp. 237-260. Lewis, Paul H. – 2002 – Latin Fascist Elites: The Mussolini, Franco, and Salazar Regimes – Greenwood Publishing Group – ISBN 978-0-313-01334-8. Laqueur, Walter – 1966 – Fascism: Past, Present, Future – New York: Oxford University Press – ISBN 978-0-19-511793-6. Nolte, Ernst – The Three Faces Of Fascism: Action Française, Italian Fascism, National Socialism – London: Weidenfeld and Nicolson – 1965. Paxton, Robert – 2005 – The Anatomy of Fascism – Vintage Books – ISBN 978-1-4000-3391-1. Payne, Stanley G. – 1966 – Falange: A History of Spanish Fascism – Stanford University Press – ISBN 978-0-8047-0059-7. Payne, Stanley G. – 1987 – The Franco Regime, 1936-1975 – University of Wisconsin Press – ISBN 978-0-299-11070-3. Payne, Stanley G. – 1995 – A History of Fascism, 1914-45 – University of Wisconsin Press – ISBN 978-0-299-14874-4. Reich, Wilhelm – 1970 – The Mass Psychology of Fascism – New York: Farrar, Straus & Giroux. Sauer, Wolfgang – National Socialism: totalitarianism or fascism?, pp. 404-424 e The American Historical Review, Vol. 73, No. 2, Kerzu 1967. Seldes, George – 1935 – Sawdust Caesar: The Untold History of Mussolini and Fascism – New York & London: Harper and Brothers. Sohn-Rethel, Alfred – 1978 – Economy and Class Structure of German Fascism – London, CSE Books – ISBN 978-0-906336-00-7. Sternhell, Zeev & Sznajder, Mario & Asheri, Maia –  1994 – The Birth of Fascist Ideology, From Cultural Rebellion to Political Revolution. – Princeton, NJ: Princeton University Press. Vatikiotis, Panayiotis J. – 1988 – Popular Autocracy in Greece, 1936-1941: A Political Biography of General Ioannis Metaxas – Routledge – ISBN 978-0-7146-4869-9. Weber, Eugen –  1985 – Varieties of Fascism: Doctrines of Revolution in the Twentieth Century – New York: Van Nostrand Reinhold Company – Pennadoù zo diwar-benn luskadoù faskour e lies broioù. ↑ Paxton, Robert. The Anatomy of Fascism. Vintage Books. ISBN 1400033918. ↑ Griffin, Roger. The Nature of Fascism. Palgrave Macmillan. ISBN 0312071329. ↑ "Fascism", Encyclopædia Britannica (8 a viz Genver 2008). ↑ Passmore, Kevin. Fascism: A Very Short Introduction. Oxford University Press. ISBN 0192801554. ↑ Laqueuer, Walter. Fascism: Past, Present, Future. Oxford University Press. ISBN 019511793X. ↑ Eatwell, Roger. Fascism: A History. University of Michigan. ISBN 071399147X. ↑ Payne, Stanley. A History of Fascism, 1914-45. University of Wisconsin Press. ISBN 0299148742. ↑ Nolte, Ernst. 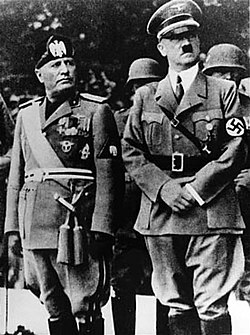 Three Faces of Fascism: Action Française, Italian Fascism and National Socialism. Holt, Rinehart and Winston. ↑ Fritzsche, Peter. Rehearsals for Fascism: Populism and Political Mobilization in Weimar Germany. Oxford University Press. ISBN 0195057805. ↑ "Collectivism", Encyclopædia Britannica (8 a viz Genver 2008). Kemmoù diwezhañ degaset d'ar bajenn-mañ d'an 13 C'hwe 2019, da 11:30.